What was the New Jersey Devils franchise seemed very much like a lost soul in 1983-84. They had just arrived in the Garden State in 1982 after failed stops in Kansas City and Colorado, and the dregs of those squads showed no signs of taking the Devils anywhere in their first year. 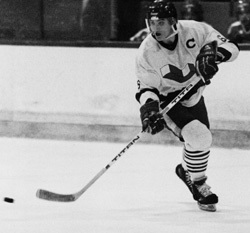 There was some buzz about 1st rounders John MacLean, Ken Daneyko, and a fiery little wing named Pat Verbeek, but it was years before they would realize their potential. In fact, they were so desperate for ways to build they spent a few late draft picks in 1983 on players that nobody expected to see in the NHL: young Soviet stars Alexander Chernykh, Alexei Kasatonov, and Slava Fetisov. The Penguins, on the other hand, had gone from original-expansion-squad-made-good in the late 1970s to a shockingly bad team in 1982-83 — so bad, in fact, there were whispers it might fold within a year. But unlike the Devils, the Penguins had a number of players ready to contribute, including under-appreciated sniper Mike Bullard, prolific offensive defenseman Randy Carlyle, promising young center Doug Shedden, and steady veteran Rick Kehoe. 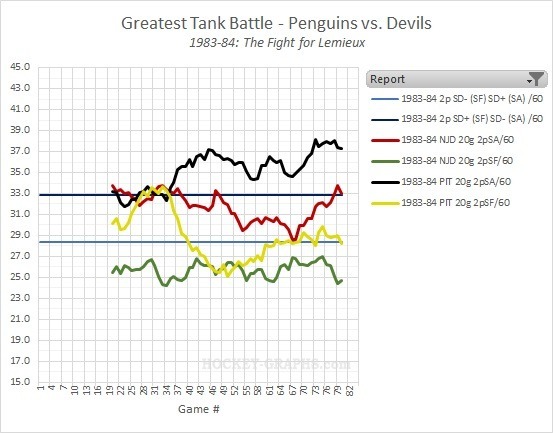 In a previous post, I used graphs to portray the very deliberate attempt by the Penguins to scrap their attempts at contending and make a move for the #1 pick; now I’d like to place those measures alongside the Devils’ and give us a sense of the battle to the bottom — the real tank battle. Looking at their 20-game moving possession measures (measured by 2pS%, described here; the straight lines are one standard deviation above and below league-average), I think it demonstrates two completely different ways that teams arrive at the bottom: one team tanking, the other simply a bad team. Is one wrong or the other right? Is a poorly-constructed team going into the season more justifiable for the #1 pick than a team that deliberately breaks it down mid-season? In this case, I would probably say yes. The Devils inherited the mistakes of the Colorado Rockies management, and their drafts in 1983 and 1984 (adding Daneyko, Verbeek, MacLean, Chris Terreri) demonstrated they were good at identifying talent. But let’s say it’s the kind of battle like we’re seeing this season, with a number of teams either having tanked or rolled into a bad season with eyes open. Do you want a poor front office to get the pick, or one that knows enough to tank? 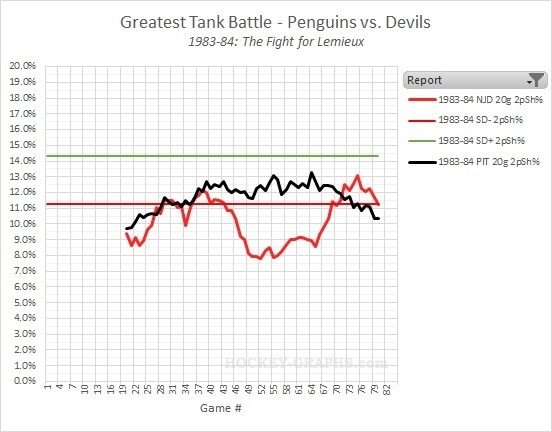 There is some suggestion that the Devils caught on to what the Penguins were doing and also tried to tank a bit. This article from the Pittsburgh Post-Gazette in October 1984 notes that Mario Lemieux himself had heard rumors that both the Penguins and Devils were tanking. Even within the season, both teams were hurling accusations at one another for tanking, and Wayne Gretzky referred to the Devils as a “Mickey Mouse operation” after the Oilers shellacked them 13-4 in late November. 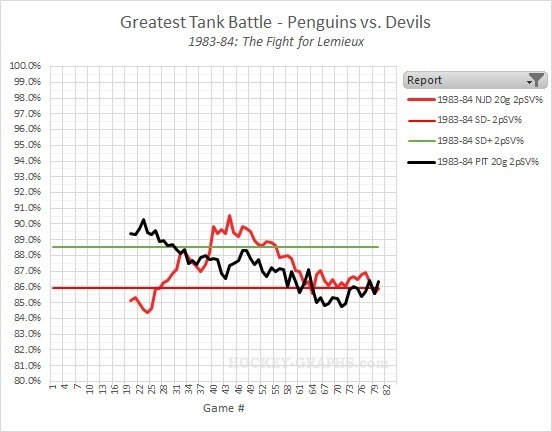 So the record suggests, even if the Devils might’ve seemed like the more acceptable tanker, neither team was getting out of this clean. Just looking at the shot breakdown above…before the Pens went for the tank, it sure seems Pittsburgh had a capable offense but atrocious defense, adeptly destroyed by trading away Randy Carlyle for no active players and shutting Rick Kehoe down for the season with a legitimately serious injury. New Jersey’s offense, on the other hand, couldn’t be bothered to budge, tank or not. So maybe New Jersey was more deserving of a prolific scorer like Lemieux. Neither team really seemed to defy shooting percentage too much — okay, the Devils dipped, but if they were tanking in that regard they wouldn’t rebound at the end. On the other hand, both teams knew how to field a bad goaltending crew. New Jersey’s was an old pairing of Chico Resch and Ron Low that was near the end of their careers, Low was obviously having the worse year of the two for the Devils, but they continued to swap games evenly in the stretch. Pittsburgh had a group of four mostly-injured and inept goaltenders (Michel Dion, Denis Herron, Vincent Tremblay, Roberto Romano) over the year. Unlike the Devils, the Pens had two curiosities play out: they sent down the relatively-decent performing Romano (according to GM Eddie Johnston because they were “hoping to win a championship” with their AHL affiliate the Baltimore Skipjacks), and starter Denis Herron started to play terribly. Call-up Vincent Tremblay was also given some starts in the stretch, with regular backup Michel Dion shut down late in the season with groin issues. Tremblay proceeded to play like he was the one with the groin problems, surrendering 24 goals in 4 of the Penguins final 13 games. There was some justice, then, in Lemieux refusing to acknowledge the pick and wear the Penguins jersey when his name was called. He laid them bare even if they wouldn’t, and he did nothing less than get his contract and proceed to fulfill everything the franchise could have wanted from him. He even brought them a successor in Sidney Crosby. The Devils ended up with Kirk Muller, a solid player in his own right, and while they wouldn’t get their Stanley Cup for another decade, they swapped places in the standings with the Penguins a couple times over the remainder of the 1980s and rode a continued wave of solid drafting* and smart trades to build one of the league’s better teams for the bulk of the 1990s and 2000s. 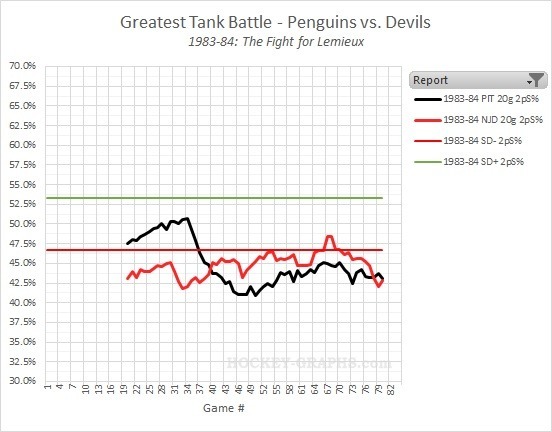 However you feel about the tank, the fact of the matter is that a lot of franchises have used it to build sustained success, and even in the greatest of tank battles it fostered a healthy cycle of success within the league. Just don’t say that to Oilers fans. *Martin Brodeur was obviously a major coup, but what flies under the radar is they had an unusual amount of success drafting goaltenders. Chris Terreri, Craig Billington, Sean Burke, Kirk McLean, and Mike Dunham were all drafted by New Jersey from 1983 to 1990 and would go on to decent NHL careers. Good article overall, but my understanding is that Lemieux didn’t put on the jersey on draft night because he was dissatisfied with the way contract negotiations were going, not that he was offended by tanking. Also, it’s kind of a reach to say Lemieux brought the Penguins a successor in Crosby. I mean, literally anyone would have drafted Crosby. Granted, if Lemieux never came to the Penguins, maybe the team doesn’t last in Pittsburgh. So in a roundabout way, I guess you might be right about it. Still, the draft day stuff is wrong.